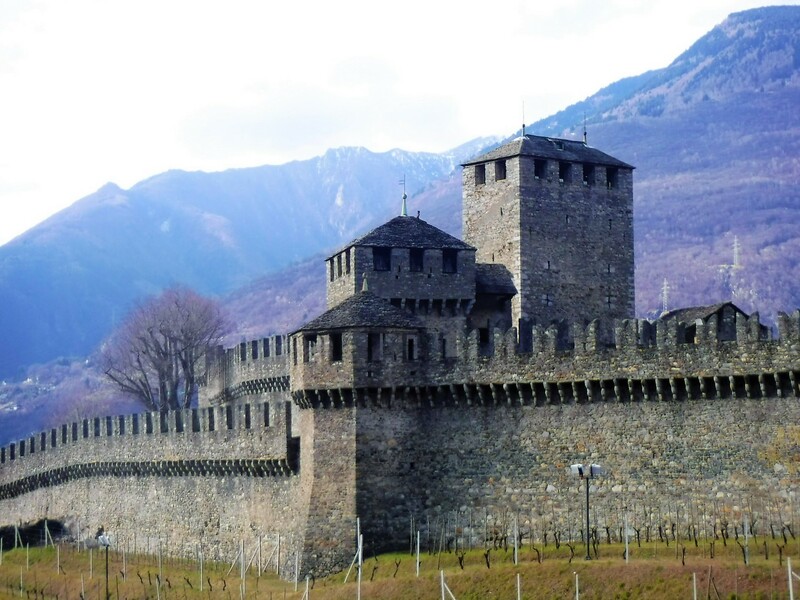 Lying east of the Ticino River at the foot of the Alps is the Swiss village of Bellinzona. 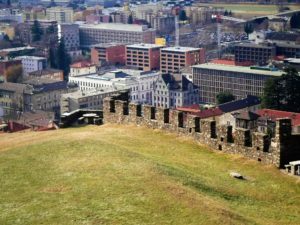 There are many things that make this city a fantastic place to visit. 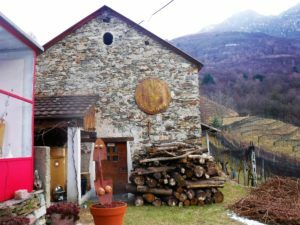 There’s its abundance of orchards and vineyards, its thick forested hills, and sprawling green alpine pastures. 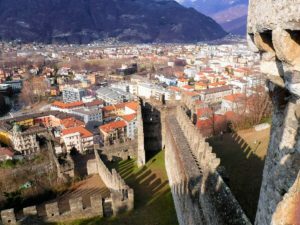 There’s Bellinzona’s fascinating Roman history, as well as its undeniable Italian influence and its proud Swiss heritage. 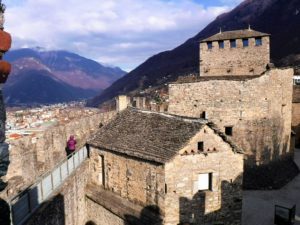 Yet, out of all the things that make Bellinzona a must-see place, there is still something else that really makes this place stand out on a map. 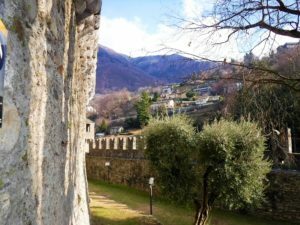 The thing that makes Bellinzona such a fascinating place is it has, not one, but three magnificent castles all within the boundaries of its city! 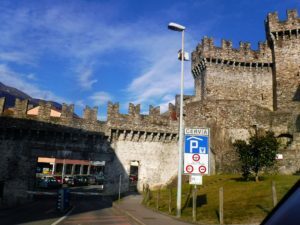 The Castelgrande, the Montebello, and the Sasso Corbaro have been a part of the UNESCO world heritage sites since 2000. 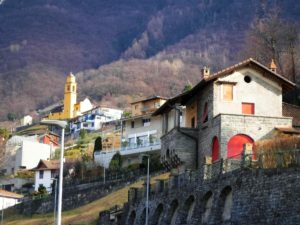 The Swiss city of Bellinzona shares much of that old world charm with its Italian neighbor. 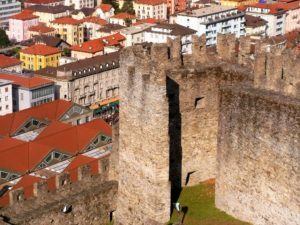 A large archaic wall still protects this fortified city. 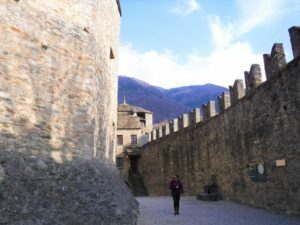 The Sasso Corbaro Castle can be seen atop the hill. The beautiful chapel of San Sebastian Church is the prominent structure pictured in this backdrop. Rebecca needed to first zip up her coat before she could truly enjoy exploring “medieval life”. 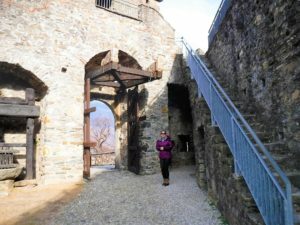 Due to our limited time, Rebecca and I were only able to explore the grounds of one castle. 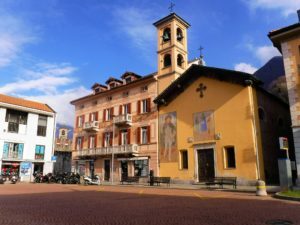 We chose to examine the middle one – Montebello. 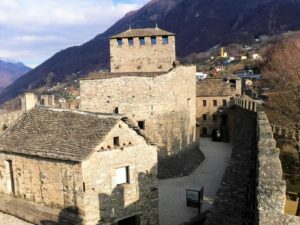 Montebello Castle, (also known as the Small, New or Middle Castle in the 15th century, as Schwyz Castle after 1506, and St. Martin’s Castle after 1818) is located to the east of the town center. 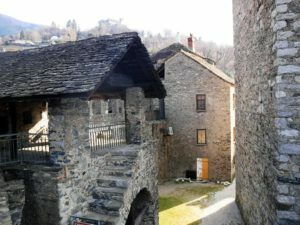 The structure was built around 1313 AD. 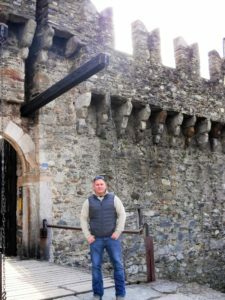 If you’ve read my entirely true story, Life is Good when you’re the King Of Bruges, you would totally understand why Big John always feels at home inside of castles. 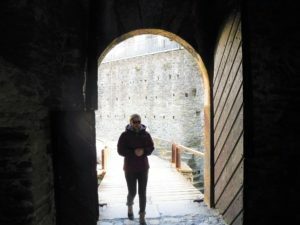 Rebecca, who can be seen here shivering in her boots, is trying to find a way to close the main castle doors. We are in a real castle and all she is worried about is stopping the draft from coming in! 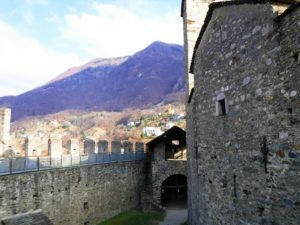 The grounds around the castle were simply beautiful. 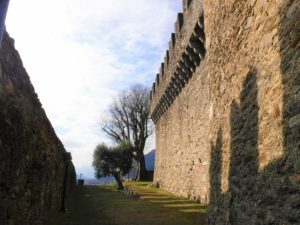 Check out the arrow slits in the walls for firing off those crossbows! I’m no detective, but something tells me that the glass in those upper windows might not be the original panes. Geez! I take her to a drafty castle… in the Alps… in the dead of winter, and all she can do is complain about being cold! 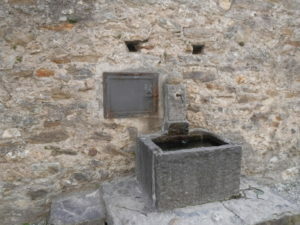 This water fountain was probably constructed around the same time as the Black Death Plague. For that reason alone, I chose the swish and spit method of castle water fountain usage. 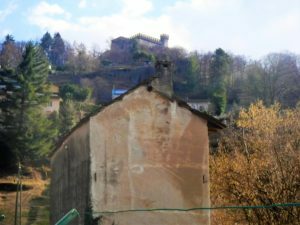 Those external electric lights are over 700 years and they still work… I’m joking! I obviously have no idea if they still work. 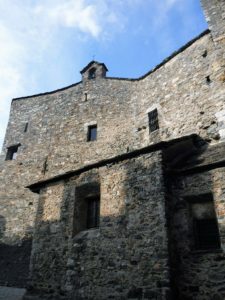 In the 19th century, Montebello Castle fell into disrepair until renovations were started in 1903. She’s looking for a bathroom with modern plumbing… Did I mention she’s pregnant with our baby girl? Whomever built this castle must have been very progressive to think of gender-neutral facilities. At any rate, I’m glad she found that bathroom or we’d be ending this tour rather abruptly! Who knew? 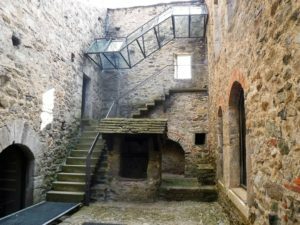 Even medieval castles were expected to comply with code and install handrails on stairs and landings. I’m glad to see that people were so safety conscious back in the dark ages. 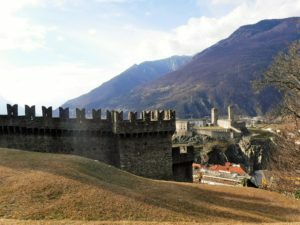 This view of Castelgrande was captured from the ramparts of Montebello. 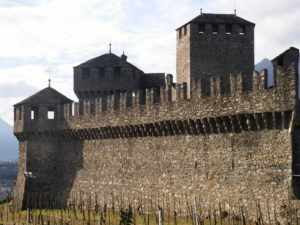 The fortifications at Castelgrande have been around for a very long time, dating as far back as the late 1st century BC. 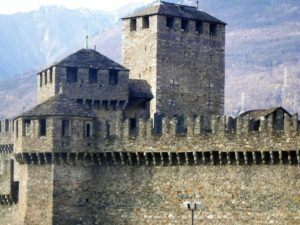 Until the 13th century, Castelgrande was the only real fortification in Bellinzona. 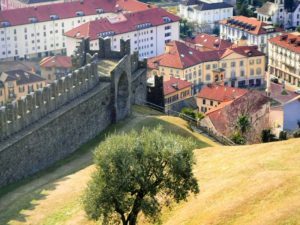 During its history, this castle was referred to as the stronghold of the city. 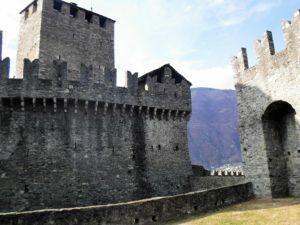 The exterior walls of Montebello extend all the way down the mountain where they connect with the walls of Castelgrande. She thought she was being stealthy, but you see I caught her as she stole away to the warmth of our car. 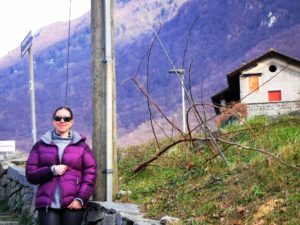 I was going to ask Rebecca if she wanted to have a picnic on one of those tables overlooking the city; but that was before realizing she had already driven down the mountain and left me far, far behind. 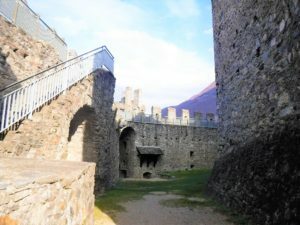 Castle life can be seriously lonely at times! 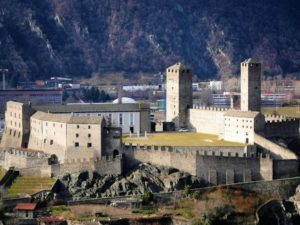 Unlike Castelgrande, Montebello Castle was not protected by the natural mountainous terrain. 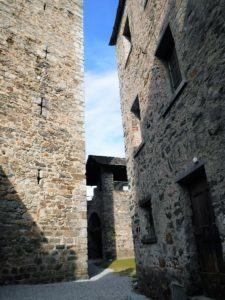 To provide for the security of its walls, Montebello Castle is completely surrounded by deep moats. Just to set the record straight, and to avoid having to sleep out in the cold, Rebecca never left me at the castle. Although she was hungry, cold, and very much pregnant, she stuck by my side like a real trooper. She is and will always be my faithful sidekick in all of our little adventures. 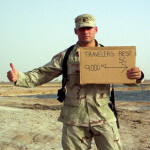 As always, thank you for visiting Big John’s Adventures in Travel and please visit my site again real soon. 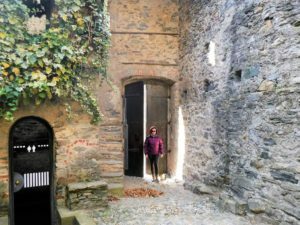 I hope this post has inspired you to pack those bags and find a little adventure all of your own making.